This walk starts from Porta Maggiore and it follows Via Prenestina, the ancient Roman road leading to Praeneste (Palestrina). Soon after the fall of the Roman Empire the road was abandoned and it was reopened only in the second half of the XIXth century. 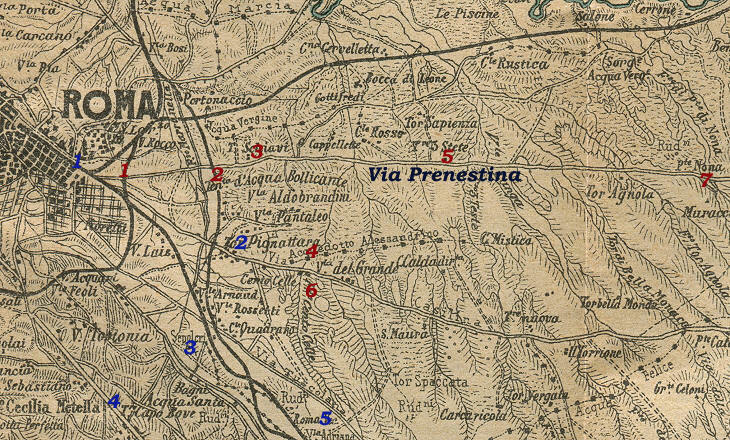 Today the initial stretch of Via Prenestina is a highly populated area and some of the ancient monuments shown in this page are surrounded by tall blocks of flats. 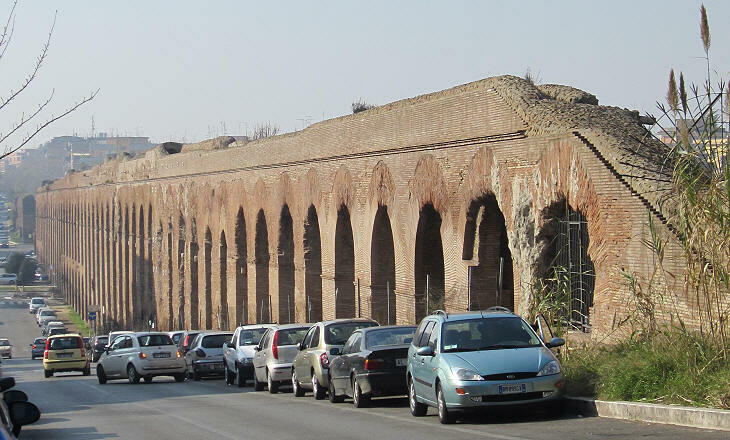 Via Prenestina was less important than other Roman roads such as Via Appia or Via Flaminia, nevertheless some wealthy Romans chose it as the location to erect their tombs; most likely they were the owners of some villas in the area or they came from Praeneste. 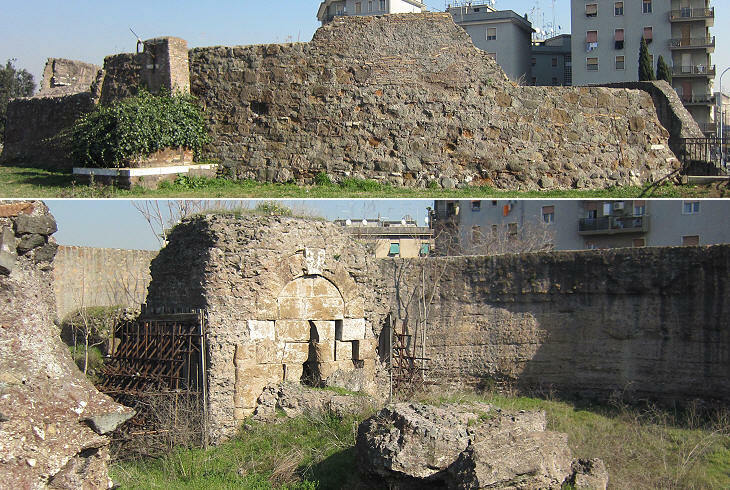 A very large mausoleum stood at the second mile of Via Prenestina; the remaining circular wall surrounded a mound hiding the burial chamber; the mausoleum was damaged during WWII when this quarter of Rome was bombed, due to its proximity to the city's railway warehouses. 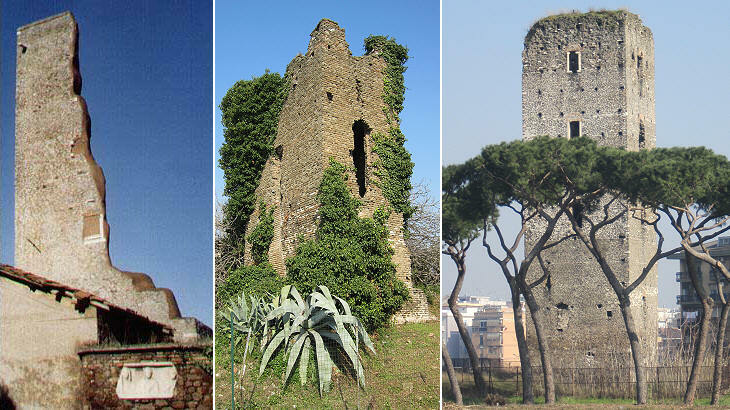 Because of its vague resemblance to a tower it was called il Torrione; after the war the earth was removed and the burial chamber was unearthed. 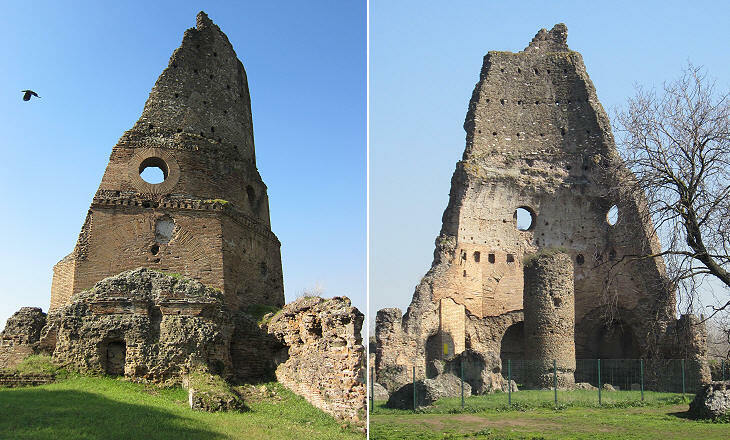 The mausoleum is thought to have been built in the Ist century AD because of its similarity to the tombs of Cecilia Metella and Lucilio Peto, who lived at the time of Emperor Augustus. Largo (square) Preneste is the centre of a very busy and congested borough of Rome. 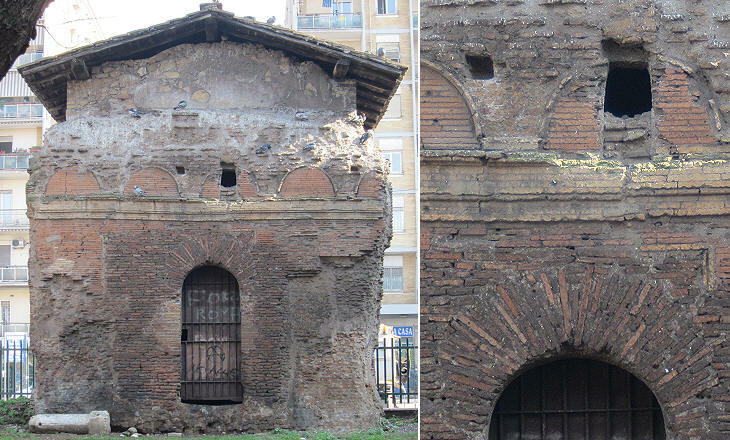 A small Roman tomb made of brickwork and having the shape of a small temple is the totally out of context embellishment of Largo Preneste. The building was used for centuries as a house or a granary and small windows were opened in the thick Roman walls. 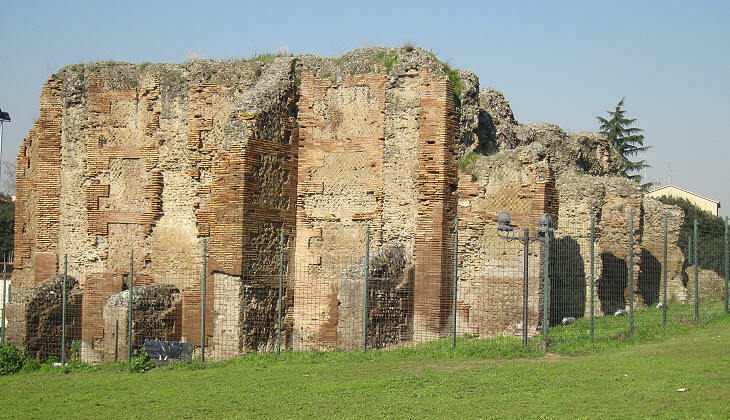 At the third mile of Via Prenestina a public garden provides a wide array of ancient buildings with a more appropriate setting than Largo Preneste. The area is known as Tor de' Schiavi (slaves), but it has nothing to do with slavery; the name comes from Vincenzo Rossi dello Schiavo who acquired the buildings and the nearby land in 1571. A tower was built in the Middle Ages on top of an octagonal hall covered by a dome which most likely was part of ancient baths. The cylindrical wall at its centre supported the steps leading to the top of the medieval tower. The hall is thought to have been built at the beginning of the IVth century AD; this because of a construction detail (i.e. 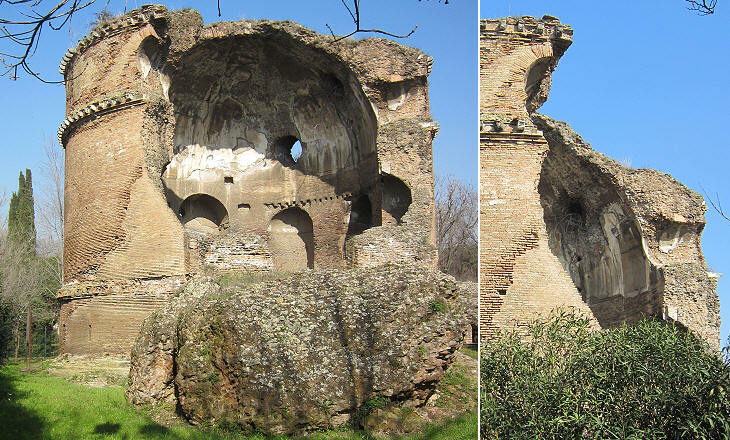 the use of pottery to lighten the weight of the dome) which can be observed at the Circus built by Emperor Maxentius (near Cecilia Metella) and at the Mausoleum of St. Helena (Tor Pignattara) which were built during that period. 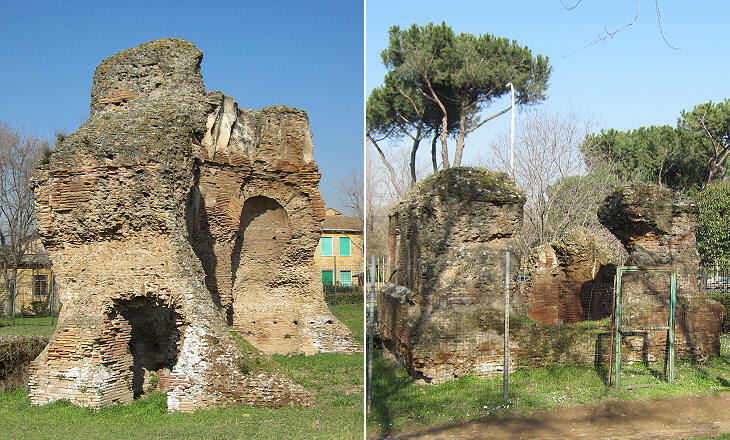 The garden is named Villa Gordiani after the Roman Emperors Gordianus I, Gordianus II and Gordianus III; they were emperors in 238-44 AD, during a period of turmoil known as the Military Anarchy; their family had a large estate in the area. The remaining main building however was erected later on, at the beginning of the IVth century AD. We still do not know to whom the large circular tomb was dedicated. 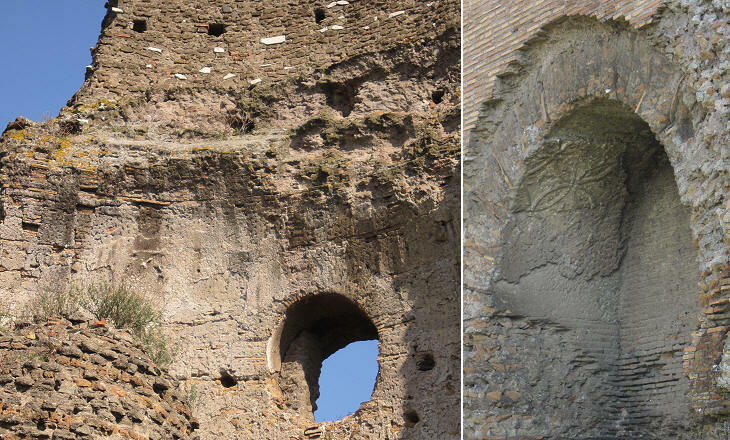 The partial collapse of the dome shows that it was very thin at the top to reduce pressure on the supporting walls; this can be observed also at the Pantheon, the largest ancient dome. The building was for a certain period used as a church and the dome ceiling has some faint traces of frescoes. 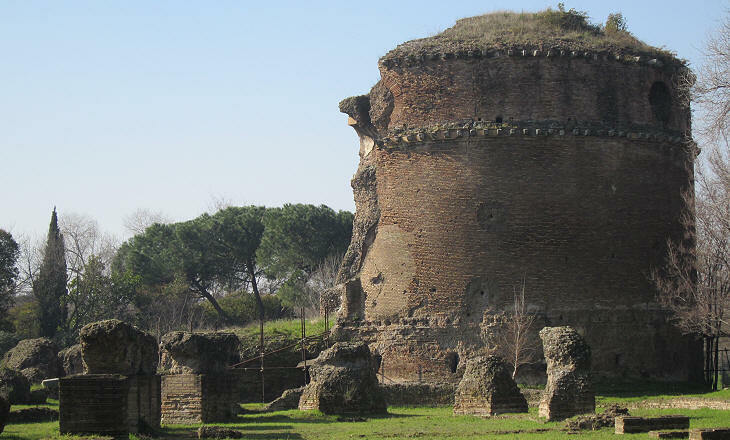 The existence of a large bath complex is proved by several cisterns with a large storage capacity. A puzzling aspect is that, based on their construction technique, they are dated to a much earlier period than the octagonal hall. Ruins of other ancient buildings can be found in this garden and in another one which is located on the opposite side of Via Prenestina; however the lack of inscriptions and historical sources do not have allowed a precise identification of the purpose of the buildings and of their owners. 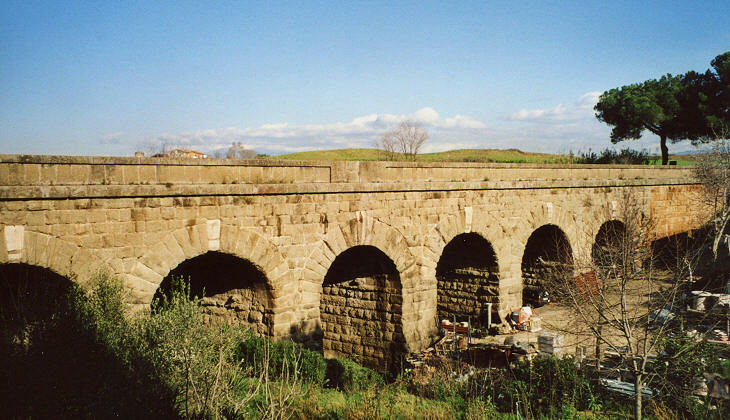 Aqueducts testify to the advanced construction techniques developed by Roman engineers; the movement of water was based on gravity and this meant that an appropriate gradient was required along the whole length of the aqueduct, the route of which was carefully planned in order to exploit as much as possible the shape of the ground; in the case of the aqueduct built by Emperor Alexander Severus in 226 AD to supply water to baths near today's Palazzo Madama, engineers found a route which kept the water conduit very near the natural level of the ground; this was not possible however at a depression near Via Prenestina and an imposing series of arches was built to bridge the gap. 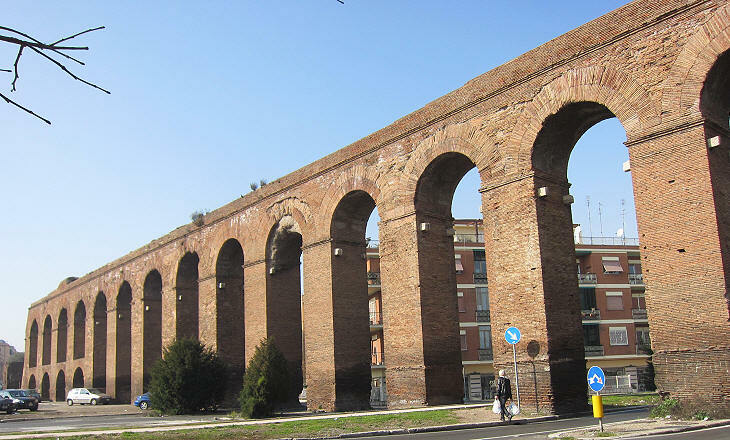 The landscape of the Roman Campagna was characterized by ancient aqueducts and by medieval towers until the beginning of the XXth century. Tor Tre Teste (three heads) was named after the funerary relief portraying three heads which was walled at its base (now replaced by a copy). Torre di Centocelle, a very tall tower, was built in the XIIth century to protect a property of S. Giovanni in Laterano and it was therefore known as Torre di S. Giovanni. At the IXth mile Via Prenestina steps across a brook by a 125 meter bridge built in the Ist century BC. Ancient Romans had a penchant for designing straight line roads and to achieve this result they were often uncompromising. Nevertheless when one sees the small stream below the bridge (even assuming it had been broader 2000 years ago), the decision to build such a large bridge can only be justified by the policy of public works which the Senate and the emperors put in practice to keep the Roman plebs busy. A similar policy was followed by the popes: Pope Clement XI used to justify the expense for new churches, fountains, etc by saying: E' tutta beneficenza! (it's all charity!). Bibliography for this page: Prof. Alberto Manodori and Giuseppina Pisani Sartorio - Via Prenestina in Roma Archeologica - Elio de Rosa Editore 1999.